Following the Samsung Galaxy A5 and the stunning Galaxy A7 devices from the major Korean manufacturer, another A series phone has started receiving the same. This time the Samsung Galaxy A3 (2016) and many of its variants have started hitting the popular Nougat OTA update. The new OTA update will take the A3 to a new firmware build number A310FXXU3CQE6 (baseband). It brings all the Nougat goodies including DND, notification shortcuts, app permissions, Doze Mode, and much more. The Android 7.0 OTA is currently rolling out in the European region and first spotted particularly in Germany for model number SM-A310F which is the 2016 variant. As the A3 2016 Edition receives it, Nougat will soon spread to the 2017 models as well. All you need to be is be patient. Unfortunately, the Nougat full firmware files are not available just yet. However, the tutorial should get you the new update. The Odin files should be updated from Samsung Servers soon. Meanwhile, see the alternate way to download the OTA for A3. How to download Android 7.0 Nougat update for Samsung Galaxy A3? 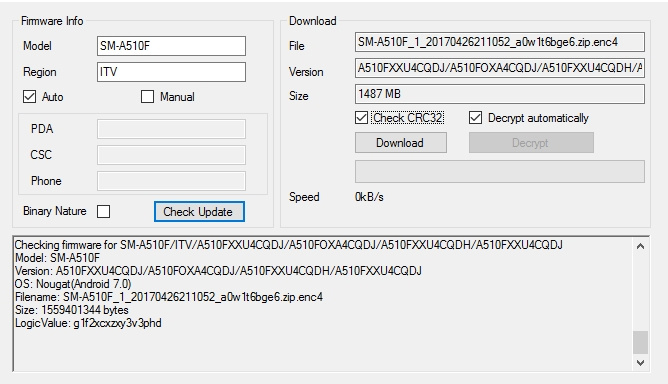 The following Samsung firmware tool will help you download the latest full firmware Odin files for Samsung Galaxy A3 just like any other Samsung phone. As the Android 7.0 Nougat update isn’t available yet as full firmware file, simply download the latest update available there. With SamFirm tool, you can download updates safely, faster, and comes directly from Samsung servers. It has no restrictions for downloading the firmware. No speed limit, no bandwidth limit. Download Samsung Galaxy A3 Odin flashable firmware directly from Samsung Servers. How to update Samsung Galaxy A3 to Nougat via Odin? As Nougat full firmware is not yet available, download the Android 6.0.1 Marshmallow full Odin file from above. You will also need ODIN TOOL – Download Link, to install the update and restore the device to stock. Verify your device and download the exact firmware for your Galaxy A3 phone. Enable USB Debugging and Advanced Reboot from developer options on your A5 device. Also, Enable OEM Unlocking from Developer Options the same way. Extract and run Odin software on your PC. Reboot device into download mode using the Advanced reboot. Connect the phone via USB cable. Now click on the AP/PDA tab in Odin and add the stock Nougat firmware for Samsung. It should be a .tar or .md5 extension. Click on start option and begin the flashing. It takes few minutes to see the PASS message. You will get a Nougat OTA notification. Download and install via stock recovery. For detailed Odin usage instructions, see this tutorial. See how to root Galaxy A3 on Nougat update. Next Entry How to root Samsung Galaxy A5 and A7 on stock Android 7.0 Nougat update?